As an entrepreneur, I’m often asked why I started my business and what makes us unique. Over the past 12 years, I’ve found that my ability to share the story of our business is fundamental to our success. To me, our story is about our brand — what we stand for, why we do what we do and why we believe in it. While many organizations recognize the importance of brand, many have a harder time expressing their brand through a unique selling proposition (USP) to different audiences. The USP is a concept that has evolved from a factual, externally focused message to one that is more holistic; it now has to touch and inspire your target audiences, whether it is your customers, employees, or partners. In our world, we believe it’s the foundation for communications and a core capability of our firm.Defining a solid and meaningful brand is foundational to any business and is the base of healthy and meaningful relationships with your target audiences. Women entrepreneurs have a unique opportunity to build an authentic and compelling USP that will distinguish them from their competitors, inspire their employees and continue to help them embrace non-traditional approaches to success. 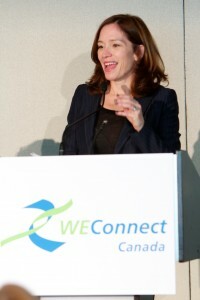 At the WEConnect Conference, I shared examples of the detergent that washes whiter, and the iögo yogurt brand (our client) that is owned by Canadian dairy farmers – a brand that is fun and simple. The latter evokes not only an emotional response for the consumers, but also integrates the people who are at the source of the products, the farmers. a. Personal purpose: why do you wake up every morning to go to work? What is your impassionned reason to do what you do? b. Business purpose: what is your business reason to exist? If your business disappeared, what would the world be missing? c. Does your business purpose align with your personal brand? Does it resonate with your critical target audiences’ expectations, as well as with your business strategy and business environment? a. What is your one, precise message? b. What is your personality, your tone, your style? If your company was a person, how would it behave? c. What are the different messages for your target audiences? a. What do your executive team, your employees and customers think of your brand? Do they share the same beliefs? Do you need to tweak it to help them believe? b. Who can and should become ambassadors or your brand? Should they be trained to do so? c. Is your internal communication strategy aligned with your USP? d. Does your marketing material embody your USP?